We are big fans of raptors and large birds here. 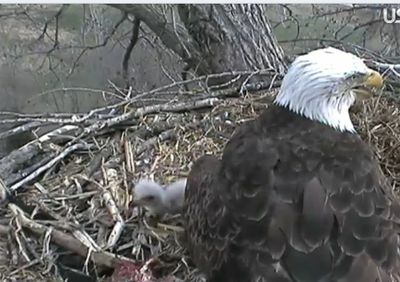 I found this link on Facebook and we've been mesmerized for days now by the live feed action inside this eagle nest in Iowa. There are 3 tiny eaglets - just days old - growing rapidly, fed and tended by their devoted parents 24/7. You don't have to watch very long to see the parents feeding them- about every 30 minutes or so. Yesterday I saw Papa land and deliver a big rabbit to the nest, today a starling. Mama is larger than he is and spends most of her time in the nest covering the little ones in the "bowl". They are out in the air more now though, exploring the nest, flapping their tiny wings and testing Mama's tolerance for adventure. In the background you can hear the cackle of starlings, cars driving by, the wind whistling as well as the trill of redwing blackbirds, my favorite birdsong. Just the peacefulness of the spring sounds in rural Iowa is lovely to our midwestern ears. I went to Mom's yesterday and got her laptop out which never sees any action. Putting this on and watching her light up made me realize that each of us (120,000 at a time tuning in) immediately feels an affection and personal connection to this little family. It's an absolutely fascinating scene. And if you are up at 3 am thinking about all the things you should be doing instead- it's still watchable thanks to an infra-red camera. Screen shots below catch a shift change.